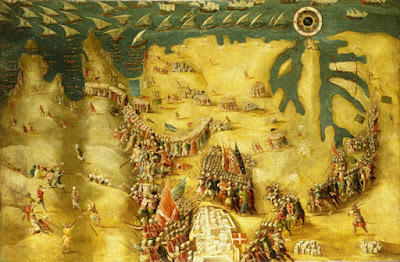 The Siege of Malta – Flight of the Ottomans by Matteo Perez d’Aleccio, showing Don García’s relief force battling the retreating Ottomans. For a week there was an uneasy lull in the fighting. The bombardment of Birgu and Senglea never ceased, but the Turkish forces made no more attacks on the tottering bastions of Castile and St Michael. Then, on 1 September, Mustapha and Piali launched another mass offensive. Rendered desperate by the lateness of the year and by their lack of stores and ammunition, it was as if they were determined, with this last throw, to make good all their losses. But the troops who now surged forward across the shell-torn waste land beyond the walls were not the same as those who had first come to Malta ‘to save their souls’. It was not only the prolonged resistance of the garrisons and their bloody losses which had sapped their morale. Disease had enfeebled them and had reduced their numbers far more than had the cannon, the muskets, and the swords of the Knights. In that hot summer the whole island around Grand Harbour stank like a charnel house. The Turks with their ignorance of the elementary principles of sanitation contrived their own ruin. Dysentery, enteric, and fever, had been active in their ranks since June and had increased throughout the following weeks. The reason why the defenders in their shattered garrisons did not suffer so much as the enemy can probably be traced to the Knights’ principal avocation, that of Hospitallers. Simple though their surgery was, and ignorant though they were in many ways, they did at least understand the rudiments of hygiene. In the Hospital, where under normal conditions both rich and poor, Knight and commoner, were served their food off silver plate—to increase ‘the decorum of the Hospital and the cleanliness of the sick’—even during the siege, some attempt was made to look after the patients properly. It was no doubt for this reason that the garrisons owed their relative freedom from the diseases which decimated the enemy. The day-long attacks of 1 September failed as had all the others. The fire had gone out of the attackers and, proportionately, the morale of the defenders had increased every day since Mustapha’s failure against Mdina. Turks, Janissaries, Iayalars, Algerians, Dragut’s corsairs, all were now despondent. ‘It is not the will of Allah’, they said, ‘that we shall become masters of Malta.’ Had they known what had happened to the relief force destined for the island, it is possible they would have plucked up courage and taken the initiative again. Don Garcia’s fleet, sailing westerly for its rendezvous off Linosa, had run straight into a heavy gale. The channel and the narrow seas between Malta and Sicily are notoriously treacherous. When a strong north-westerly, with all the fetch of the Mediterranean behind it, blows over these shallows a dangerous breaking surf builds up in a few hours. At the turn of the year, just as the summer was giving way to autumn, Don Garcia’s fleet was unlucky enough to run into just such a typical Malta channel gale. Dispersed over the sea between Terrible Bank, Linosa, and the Aegadean Islands off the west coast of Sicily, the ships were forced to run for safety. The galleys plunged and stooped as they strained to get back under the lee of the land. Oars were shattered, sails and rigging torn away, and equipment lost. When the bulk of the fleet reassembled off the island of Favignana, opposite to Marsala on the west coast of Sicily, the condition of the ships was such that there could be no question of an immediate return to Linosa. Not only had many of them suffered extensive damage, but their sea-sick troops were in no state to land and fight the enemy on Malta. It was not until 4 September, that the fleet was ready to sail again. This time it reached Linosa in safety, and Don Garcia de Toledo found La Valette’s last message waiting for him. In it, the Grand Master explained how the whole south of the island was in the hands of the Turks and that the two ports of Marsasirocco and Marsamuscetto were occupied by their fleet. He suggested to the Viceroy that the two best places for him to land were the bays of Mgarr and Mellieha in the north of the island. Both had sandy beaches where his troops could go ashore, and both anchorages were relatively sheltered. The fleet left Linosa for Malta in two divisions, the advance guard being under the command of the Spaniard Don Cardona, with the Viceroy in charge of the main body. Bad weather set in yet again as they neared Malta. The bulk of the fleet, losing sight of Don Cardona over night, stood to the north and came to anchor off the fishing village of Pozzalo at the southern tip of Sicily. The advance guard meanwhile had pressed on through the thickening weather and was in sight of the island of Gozo. Now was the time when Piali’s ships by all the rules of war should have fallen upon them and destroyed them. Yet it is one of the mysteries of the siege that no attempt seems to have been made to attack this spearhead of Christian ships. One can only assume that Piali’s captains, not liking the look of the weather, had all retired from their Gozo patrol and had made themselves snug in Marsamuscetto. But the Viceroy’s action again made people doubt whether he intended to profit by his advice (La Valette’s information that Mgarr and Mellieha would be good places to land); instead of entering by the channel between Gozo and Malta he coasted down Malta on the western side, and let himself be seen by the Turkish frigates which came out of Marsasirocco. It seemed that he sought less to make a landing, than to find some fresh obstacle which would oblige him to depart and return yet again to the ports of Sicily. It was not until the evening of 6 September that Don Garcia’s reunited fleet slipped through the Gozo channel and came round to Mellieha Bay on the north east of the island. On the morning of the 7th the long-expected, long-delayed, relief force began to stream ashore. They plunged through the shallows, with their weapons and ammunition above their heads, while boatloads of Spanish soldiers ran up on the beach at the end of the bay. The news reached Mustapha Pasha and La Valette at almost the same moment. To the one it brought dismay, to the other the knowledge that his long ordeal was nearing its end. Yet, after so long a time of waiting, La Valette had undoubtedly expected that the relief force would be a great deal larger than it was. Accounts vary as to the exact numbers of the troops, ranging from 8,000 (the lowest estimate) to 12,000. In any event, the relief force was hardly large enough to accomplish its task if the morale of the Turks had been high. As soon as he knew the numbers of the troops, La Valette devised a cunning piece of deception. He gave orders for one of the Moslem galley slaves, who were kept in the tunnels below Fort St Angelo, to be granted his freedom. It was, the man was told, an act of clemency on the Grand Master’s part. The slave was also told that 16,000 Christian troops under the Viceroy of Sicily were coming ashore in the north of the island, and that it was no use the Turkish Commander-in-Chief thinking he could prosecute the siege any longer. Whether he believed the story (or whether he was, in fact, given the illusion that he was making his escape without the garrison’s knowledge) the fact remains that this slave reached the Turkish camp safely. He was interrogated by some officers, and then brought before Mustapha, to whom he repeated his information—that the Knights were jubilant, that they counted the siege as good as at an end, and that 16,000 men were landing in Mellieha Bay. Dismayed at the news, disheartened by the whole conduct of the siege, and aware that his troops were on the verge of mutiny, Mustapha ordered the immediate evacuation of the island. The inefficiency of the Turkish high command, and particularly of the fleet, during the campaign is difficult to understand. Piali had by far the most powerful fleet in the Mediterranean, while twenty-eight galleys were all that the Viceroy had managed to raise for his invasion force. (Don Garcia had, in fact, every good reason to fear that he might lose not only his ships but also all his men.) Yet the Turkish admiral, with three times as many warships at his disposal, had never attempted to contest the landing. By all the rules, Piali should have attacked the relief force at sea and sent the Christians to the bottom—more especially when one bears in mind how irresolute had been their approach to the island. But Piali and his fellow naval commanders had assumed that the Christian fleet would try and enter either Marsasirocco, or Marsamuscetto. Accordingly, they had secured their ships in these two harbours and had barred the entrances with chains and stakes. It seems to have escaped their notice that Mgarr or Mellieha bays were perfectly adequate for landing troops—provided only that the invasion fleet did not loiter too long in these somewhat exposed anchorages. It was Piali’s timidity, coupled with his evident ignorance of the geography and weather conditions of Malta, which had from the very beginning bedevilled the Turkish campaign. Don Garcia had no intention of waiting in Mellieha. The minute that his troops were ashore he intended to return to Messina, where a further reinforcement of 4,000 men was waiting. The joy of the garrison knew no bounds. These were the first Christian ships they had seen since the siege started. Their presence off Grand Harbour told its own tale. Even those who had been sceptical about the news of a relief force, now took heart. The very fact that these galleys could be at sea just off the harbour mouth proved that the Turkish fleet had lost all fighting spirit. La Valette, eager to take the offensive as soon as possible, waited impatiently, in the hope that part at least of the relief force would try and make contact with Birgu during the night. Nothing happened. He heard the creak of wheels and groan of tackle which told him that the Turks were successfully removing their guns from the batteries behind Birgu. The Grand Master had hoped to capture them and make good some of his own losses during the siege. Mustapha’s army was now on the point of embarking. The camp on the Marsa was struck. The ships which had been lying in Marsasirocco began to make their way to the north, ready to join the bulk of Piali’s fleet as it left Marsamuscetto. Cannon that had been mounted on St Elmo and the heights of Sciberras were dismantled and taken down to the ships. The troops started to withdraw from Corradino, and from their lines behind the two peninsulas. The long entrenchments were deserted. Only the assault towers and a few cannon too heavy to remove quickly were left behind. The torn, star-shaped walls of St Elmo, whose capture had been the only Turkish triumph of the campaign, were left to silence and memory. All night long, the lights and the flares along the Marsa, and over the narrow neck of land between there and Marsamuscetto, showed where the army of the Sultan was withdrawing. The relief force, meanwhile, had marched straight inland from Mellieha Bay and had established contact with the garrison in Mdina. Under the command of Ascanio de la Corna, the troops had taken up their station on the high ground that lies on the east side of the island, a steep ridge surmounted by the village of Naxxar. Unaware that the enemy was already in retreat, de la Corna had decided to hold this high point rather than be brought to battle in the low land. As soon as day broke, he would be able to make out the enemy’s intentions. Until then he wisely decided to hold his men in check. His second-in-command, Alvarez de Sandé, was more impetuous and pressed to lead his men at once in a night attack upon the Turks. De la Corna’s discretion won the day, and the relief force waited to see what the dawn would bring.